Samuel Clemens was born on November 30‚ 1835 in Florida‚ Missouri‚ the sixth of seven children. At the age of 4‚ Sam and his family moved to the small frontier town of Hannibal‚ Missouri‚ on the banks of the Mississippi River. Missouri‚ at the time‚ was a fairly new state (it had gained statehood in 1821) and comprised part of the country’s western border. It was also a slave state. Sam’s father owned one slave and his uncle owned several. In fact‚ it was on his uncle’s farm that Sam spent many boyhood summers playing in the slave quarters‚ listening to tall tales and the slave spirituals that he would enjoy throughout his life. In 1847‚ when Sam was 11‚ his father died. Shortly thereafter he left school‚ having completed the fifth grade‚ to work as a printer’s apprentice for a local newspaper. His job was to arrange the type for each of the newspaper’s stories‚ allowing Sam to read the news of the world while completing his work. It was the newspaper business which brought Clemens to Buffalo. After courting for two years‚ Sam Clemens and Olivia (Livy) Langdon were married in 1870. They settled in Buffalo‚ New York‚ where Sam had become a partner‚ editor and writer for the daily newspaper the Buffalo Express. While living in Buffalo‚ their first child‚ Langdon Clemens‚ was born. Mark Twain lived less than two years in Buffalo at 472 Delaware Avenue, one of Buffalo’s most famous streets, just north of downtown. The house was demolished almost 100 years after it was built. Mark Twain lived in Buffalo from 1869-1871. His time here was significant and worthy of recognition as it shaped him as a writer and as a person. His time in Buffalo was the longest period that Twain had lived in one place since early childhood and the city was a place of firsts for him. Buffalo was the first place he lived as a married man, the birthplace of his first child, the first place he owned a home and the first place that he became co-owner of a newspaper. While Twain’s stay in Buffalo was difficult personally, it spurred a time of great productivity. During his tenure here, his father-in-law, Jevis Langdon, suffered from cancer and his wife, Olivia, became dangerously ill with Typhoid. A collection of his writings from this traumatic period is titled Mark Twain at The Buffalo Express: Articles and Sketches by America’s Favorite Humorist (Northern Illinois University Press; 1999). In Western New York, Twain sharpened his writing abilities as editor of The Buffalo Express newspaper. His co-editor at The Express was Joseph Larned, with whom he often collaborated on articles and columns. Larned, a lifelong friend to Twain, subsequently became director of the library in Buffalo in 1877. Another co-editor at The Express and close friend to Twain, David Gray was a well-known poet and long-standing member of the Buffalo Library board. 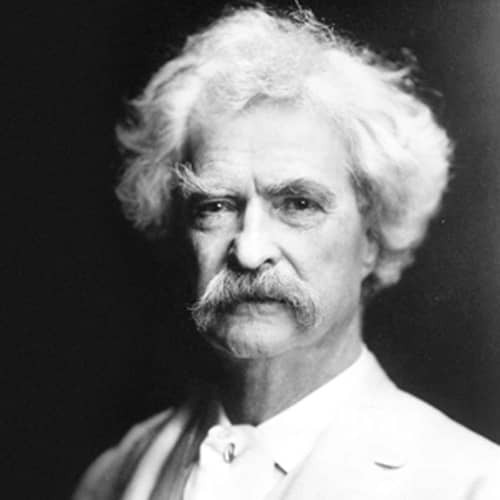 In Twain fashion, he honored his friend by naming the central character in “A Murder, a Mystery and a Marriage” after Gray. The Gray Chair of Letters at the State University of New York at Buffalo was founded in his honor. Larned and Gray were not the only Express contributors involved with Buffalo’s library. Twain was an active member of the Buffalo and Erie County Public Library’s predecessor, the Young Men’s Association and honored the Library with the manuscript of what is viewed by many as the greatest American novel. 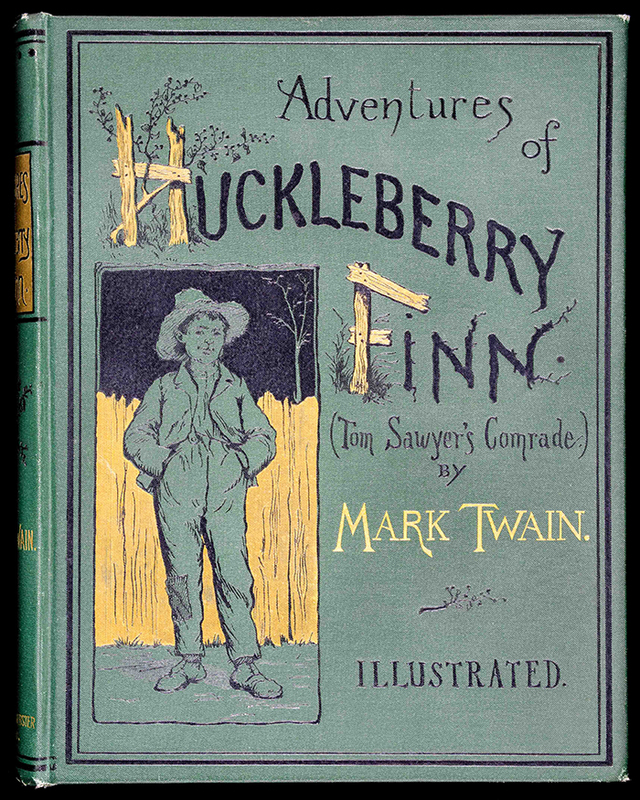 In 1885, Twain donated the second half of his Adventures of Huckleberry Finn manuscript, believing the first half had been lost by a printer. In 1991, the missing manuscript turned up in a steamer trunk in a Los Angeles home. It was among the possessions of James Fraser Gluck, the lawyer for the Buffalo Library who had requested the manuscript from Twain a century earlier. Twain eventually mailed the missing half of the manuscript, but Gluck, who had apparently taken it home to have it bound, died with it among his belongings in 1897. After gaining possession, the Buffalo & Erie County Public Library united the manuscript in 1992 for the first time in more than 100 years and showcases this cultural treasure in its Mark Twain Room with a special collection of Huckleberry Finn editions, Twain writings and other memorabilia. The novel’s preeminence derives from its wonderfully imaginative re-creation of boyhood adventures along the Mississippi River, its inspired characterization, the author’s remarkable ear for dialogue, and the book’s understated development of serious underlying themes: “natural” man versus “civilized” society, the evils of slavery, the innate value and dignity of human beings, and other topics. Most of all, Huckleberry Finn is a wonderful story, filled with high adventure and unforgettable characters.